The General Executive Board, along with more than 30 delegates from the Insulators Union, attended the North America’s Building Trades Unions 2018 Legislative Conference. Held in Washington, D.C. in mid-April, the annual conference altered its agenda to include a first-day service project. The Call-to-Action Service Day included volunteer work at the Armed Forces Retirement Home and the Vietnam War Memorial. The theme of the conference was “Our Money at Work Re-Building America’s Public and Private Infrastructure with Building Trades’ Capital.” While some of the speakers included calls for a national Infrastructure spending plan from the Trump administration, a great deal of the talk was pointed at the upcoming mid-term elections. “We aren’t waiting for the government to re-build our country, we are doing it ourselves,” said NABTU Secretary Treasurer Brent Booker in his welcoming speech on the second day of the conference. After a welcome video, NABTU President Sean McGarvey gave the keynote address, saying it is time for the building trades to lead America again. McGarvey challenged those in attendance to become involved with political issues currently facing the building and construction trades. McGarvey handed the podium over to Tennessee Valley Authority (TVA) President and CEO Bill Johnson who discussed the TVA’s $21 billion construction projects. He said union construction workers have successfully and safely completed their projects, with one project going 28 million man hours without a significant accident. California Gov. Edmund “Jerry” G. Brown was led to the stage surrounded by union members from California. Brown was honored with the 2018 NABTU Hats Off Award for his work to stabilize California’s economy, creating an historic 3 million jobs, while supporting and working closely with the California Building Trades. Among the topics he discussed was the recently passed law that requires all refinery work in the state to be completed by workers who have completed a registered construction industry apprenticeship program. Brown said the legislation will ensure this important work is performed correctly by trained and skilled workers. “I want to stand with you,” Brown said as he discussed the accomplishments of the labor community in California, then looked ahead to upcoming major projects. “We are ‘all in’ with you; we are ‘all in’ with the future; and we are ‘all in’ with Prevailing Wage, with Davis-Bacon, and with organized labor,” said Brown, to loud applause. The Carlyle Group Co-Founder and Co-Executive Chairman David M. Rubenstein followed Brown and said the private sector needs to help fund projects and labor unions need to build those projects. Rubenstein discussed how the NABTU will work with The Carlyle Group to petition New York Port Authority to rebuild New York’s JFK airport. U.S. Rep Greg Walden (R-Ore.), who chairs the House Energy and Commerce Committee, discussed how his committee has worked to include language into legislation that aids organized labor unions. “We can do it better and we can do it faster; it is critical that infrastructure gets completed by our nation’s best trained workers,” said Walden. Dan Sullivan, U.S. Senator (R-Alaska) addressed the conference and spoke about his history in labor. He talked about a few of the many projects in his state to utilize the building trades, including the trans-Alaska pipeline system. He discussed several of the issues that are facing organized labor, including how the permitting and approval process causes major delays. For a second year, Senate Minority Leader Charles E. Schumer (D-N.Y.) discussed how the building trades have built hospitals in New York and the recent success of combating legislation that would have hurt the building trades unions. He talked about his family’s ties to organized labor, his support for the “Count Me In” movement and how unions can prevail when working together. Schumer said union labor will be used to construct The Gateway project, which is designed to fix the tunnels that go under the Hudson River. This project, he said, has support from both sides of the aisle. The next speaker was Chicago Mayor Rahm Emanuel who promoted his accomplishments to improve his city, including expanded airport services He discussed the important role the building trades play in Chicago and how he believes Chicago will never be a So-Called “Right to Work” city. Emmanuel encouraged the crowd to reach out to their own mayors to discuss issues important to the building trades and why union labor is the only option for public construction projects. U.S. Sen. Joe Manchin (D-W. Va.) was the last speaker on Day 2. He started his speech talking about his humble beginnings, and then moved on to what the future might hold. “If we don’t stand up for the working people today, I don’t know where we will be tomorrow,” Manchin said, adding his support for Davis-Bacon and Prevailing Wage legislation. The afternoon of the second day included smaller group workshop sessions. The topics included: Infrastructure Involvement; National Coordinating Committee for Multi-Employer Plans Update: The future of multiemployer plans; The ongoing fight to protect and enforce Prevailing Wage laws; Mobilizing worker’s capital for good jobs and retirement security; Apprenticeship readiness 101 – Implementing the MC3 in your area; and Building Trades Fighting back against corporate fraud. The final day of the conference featured another group of mainly political speakers. U.S Rep. Cheri Bustos (D-Ill.) discussed her family’s history in organized labor. She also urged attendees to put their faith back in the Democratic party. Bustos gave her vision of what could be accomplished if the Democratic Party regains control of the House. “This is about trust and about believing in organized labor,” she said. McGarvey presented the Mark H. Ayers Community Achievement Award to the Minnesota State, Minneapolis and St. Paul Building Trades Councils for their dedication to the education of the state’s youth on apprenticeships and the recruitment of the next generation of building trades members. Martin J. Walsh, Boston Mayor and former member of the Laborers’ Union, who spoke at the HFIAW 31st Quinquennial Convention held last year in Boston, addressed the audience and gave a call to action speech that focused on what can be accomplished when organized labor works together. Walsh was followed by a special D.A.D.’s Day award presented to the Ohio State Building Trades Council. Former Local 50 Business Manager Dorsey Hager, now the Executive Secretary-Treasurer of the Columbus/Central Ohio Building and Construction Trades Council, joined the state’s delegation on stage to accept the award. Conor Lamb, a recently elected U.S. Rep. in Pennsylvania, was led onstage by union leaders including HFIAW Local 2 Business Manager Jim Cassidy. 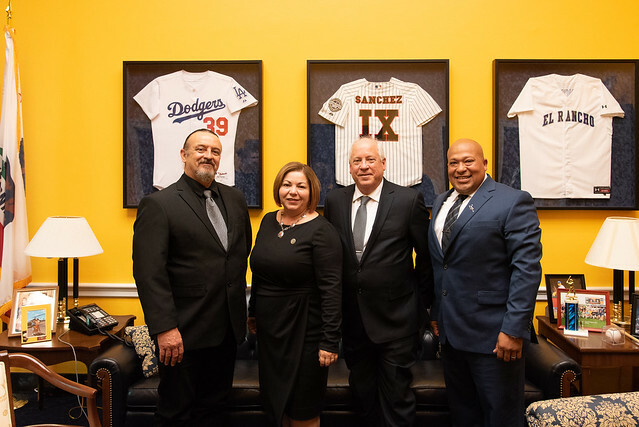 The day before his speech, Lamb met with Local 2 representatives in his office on the Hill to discuss issues and concerns facing the Insulators Union. During his conference speech, Lamb talked about large projects being built by union members in the Pittsburgh area and thanked everyone for their time and support during his recent campaign. “I appreciate the support from everyone in this room and we need to stick together to make all elections go our way,” he said. Lamb was followed by New York State Comptroller Thomas P. DiNapoli, who thanked the New York State and New York City Building Trades for their support on many of the major construction and proposals going on in the state. “Our continued partnership with the building trades will be key in the future for upcoming construction projects and all matters with the Responsible Contracting Policy,” he said. Following DiNapoli was a video about Helmets to Hardhats, which has placed roughly 26,000 military veterans into a building trades union apprenticeship programs. The video also highlighted the effort made by clothing manufacturer Carhart and their Strike Outs for Vets program, which has donated $125,400 to Helmets to Hardhats. The video was followed by Jack N. Gerard, President and CEO of American Petroleum Institute (API), who said the partnership between the oil and gas industry and the building trades is one of the most important partnerships his organization has. He applauded the safe and high-quality work performed by building trades members on API projects throughout America. Gerard also announced a new training collaboration program between API and the NABTU that will provide an API certificate to accompany union certifications. The additional certificate will give workers a leg up on new oil and gas industry jobs, he said. Gina Raimondo, the Democrat Governor of Rhode Island, discussed a $1 billion legislative plan to rebuild Rhode Island’s school buildings. The plan would include Prevailing Wage language, she promised. The last speaker of the conference was Stacey Abrams, the NABTU endorsed candidate to be the next Governor of Georgia. She talked about the quality of training that apprenticeships from union building trades offer to many of her constituents in Georgia. If elected, Abrams said she would continue to support the veteran employment through the unions in building trades and will fight against the So-Called “Right to Work” legislation. Throughout the conference and while in Washington, D.C., Brothers and Sisters were able to schedule meetings with their congressional representatives. With the help of Director of Government Affairs Chip Gardiner, HFIAW members lobbied their elected officials on the issues that matter to the union.